FDA Compliance for the “Lo” line of Eco-Friendly Topcoats | Hawk Research Laboratories, LLC. Hawk Research Laboratories has achieved FDA compliance for the recently launched “Lo” line of eco-friendly topcoats. The “Lo” topcoats were launched in April 2018 and provide a low odor, VOC compliant, and now FDA compliant versions of the standard GlasTech, IsoFree, StoneGard, IsoFree StoneGard, CounterCote, and CabinetCote topcoats, which have been standards in the refinishing industry for almost 40 years. “We’re excited to add FDA compliance for indirect food contact applications to our “Lo” line to topcoats, launched earlier this year. Our Lo topcoats offer low odor, VOC compliance, and the highest performance of any eco-friendly refinishing topcoats available in the market,” said Scott Courter, VP of Sales and Marketing. 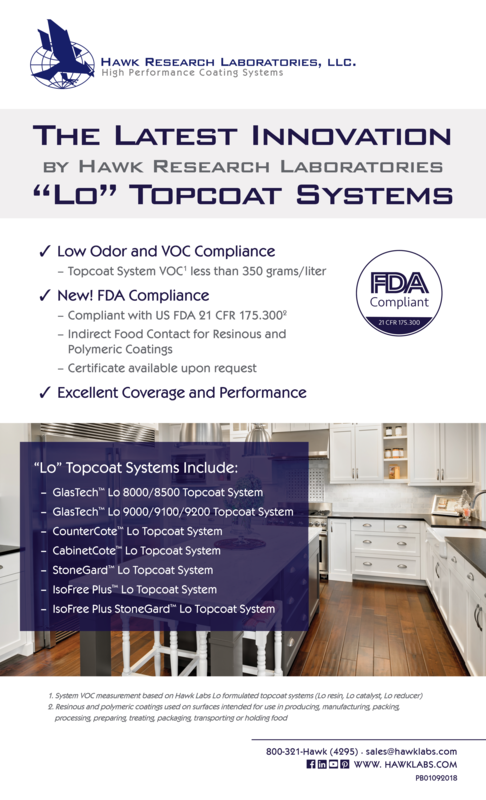 For more information on the “Lo” line of topcoats, visit our website at https://www.hawklabs.com/all-eco-friendly-products, or contact us at 800-321-4295.